The following is tangentially related to a discussion I had during a PhD examination last week, and I thought it might be worth sharing here to stimulate some thought among people interested in cosmology. 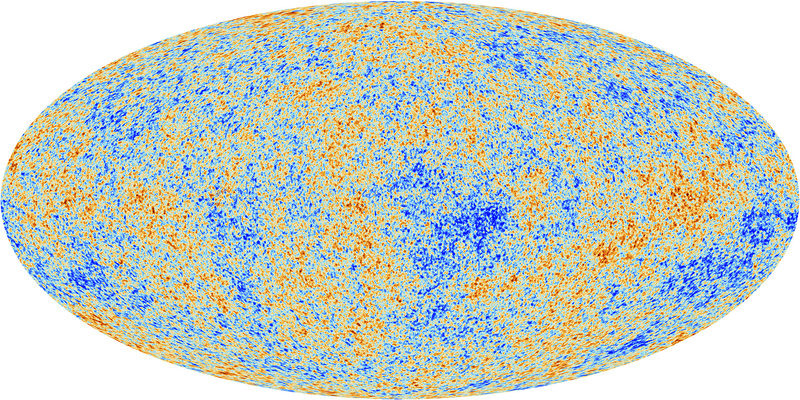 First here’s a picture of the temperature fluctuations in the cosmic microwave background from Planck (just because it’s so pretty). The analysis of these fluctuations yields a huge amount of information about the universe, including its matter content and spatial geometry as well as the form of primordial fluctuations that gave rise to galaxies and large-scale structure. The variations in temperature that you see in this image are small – about one-part in a hundred thousand – and they show that the universe appears to be close to isotropic (at least around us). This signal – called a dipole because it corresponds to a simple 180 degree variation across the sky – is about a hundred times larger than the “intrinsic” fluctuations which occur on smaller angular scales and are seen in the first map. According to the standard cosmological framework this dipole is caused by our peculiar motion through the frame in which microwave background photons are distributed homogeneously and isotropically. Had we no peculiar motion then we would be “at rest” with respect to this CMB reference frame so there would be no such dipole. In the standard cosmological framework this “peculiar motion” of ours is generated by the gravitational effect of local structures and is thus a manifestation of the fact that our universe is not homogeneous on small scales; by “small” I mean on the scales of a hundred Megaparsecs or so. Anyway, if you’re interested in goings-on in the very early universe or its properties on extremely large scales the dipole is thus of no interest and, being so large, it is quite easy to subtract. That’s why it isn’t there in maps such as the Planck map shown above. If it had been left in it would swamp the other variations. Anyway, the interpretation of the CMB dipole in terms of our peculiar motion through the CMB frame leads to a simple connection between the pattern shown in the second figure and the velocity of the observational frame: it’s a Doppler Effect. We are moving towards the upper right of the figure (in which direction photons are blueshifted, so the CMB looks a bit hotter in that direction) and away from the bottom left (whence the CMB photons are redshifted so the CMB appears a bit cooler). 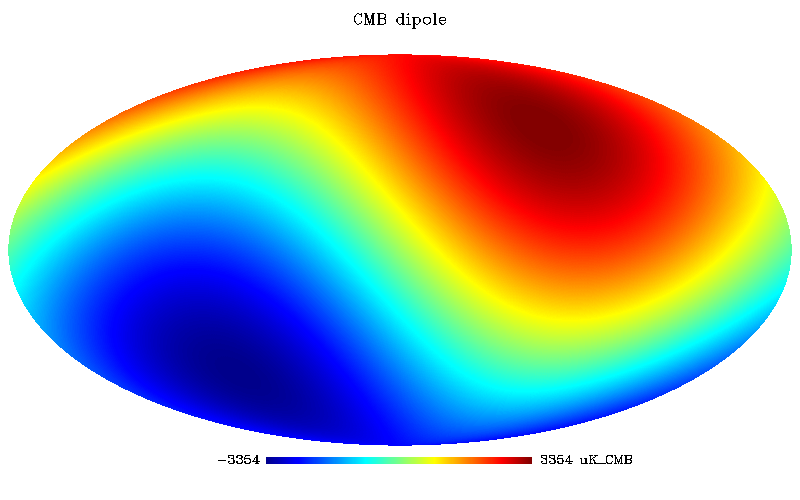 The amplitude of the dipole implies that the Solar System is moving with a velocity of around 370 km/s with respect to the CMB frame. Now 370 km/s is quite fast, but it’s much smaller than the speed of light – it’s only about 0.12%, in fact – which means that one can treat this is basically a non-relativistic Doppler Effect. That means that it’s all quite straightforward to understand with elementary physics. In the limit that v/c<<1 the Doppler Effect only produces a dipole pattern of the type we see in the Figure above, and the amplitude of the dipole is ΔT/T~v/c because all terms of higher order in v/c are negligibly small. Furthermore in this case the dipole is simply superimposed on the primordial fluctuations but otherwise does not affect them. My question to the reader, i.e. you, is the following. Suppose we weren’t travelling at a sedate 370 km/s through the CMB frame but instead enter the world of science fiction and take a trip on a spacecraft that can travel close to the speed of light. What would this do to the CMB? Would we still just see a dipole, or would we see additional (relativistic) effects? If there are other effects, what would they do to the pattern of “intrinsic” fluctuations? Comments and answers through the box below, please!